The small town called Fiesole stands on a hill north of Florence and is reached through some of the loveliest panoramic roads in the capital town of Tuscany. The first settlements in the area date back to the Etruscan era. The Etruscans were a mysterious people coming from present Turkey. But it is under the Romans that Fiesole became the most important town in the area, at least until Florence ascent. Traces of that period are still visible in Fiesole, as for example the wonderful Roman theatre, built following the slope of the hill. In the Renaissance many noble families chose to have their countryside residences built on this hill. 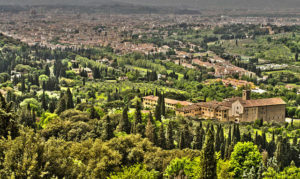 Nowadays in Fiesole there are over 30 villas – elegant buildings surrounded by well-tended luxuriant gardens. 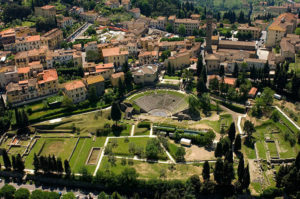 Fiesole attracts many tourists, and in spring and summer weekends the Florentine love to climb the hill and enjoy the panorama while eating an artisanal ice cream. But that of Fiesole is not the only hill around Florence. South of the town there are Arcetri (which is renowned for having been the place where Galileo Galilei was secluded), Poggio Imperiale, where you can admire one of the Florentine villas that once belonged to the Medicis, and Bellosguardo, whose name (meaning “magnificent view”) reveals its major feature. And if you still have doubts about how fascinating would be living in a villa on the hills around Florence, remember that at the beginning of the 20th century Enrico Caruso bought two of them. If you want to visit Fiesole and the hills around Florence with a private guide, check out our Guided Visits in Florence!